Hello there Vibe fans, here is another multi-tournament update for you. Since their tournament in Ohio the Vibe ladies have been working very hard, both on the court and in the gym at team 12 training. Great conditioning is a key component in their success and the team has been working hard to be in the best shape possible. Thanks to the staff and trainers for all of their hard work. 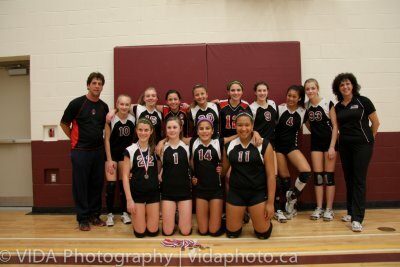 On March 3, 2012 the Vibe girls played in the 14U Girls Hawkins Cup – Championship East in King City. This was a hard fought tournament with the ladies winning GOLD. 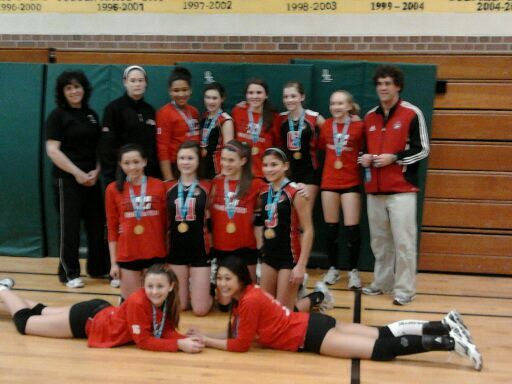 With this win it gives the Vibe ladies their second first place finish in the OVA U14 season. Since Provincial rankings are based on the average of a team’s two best finishes, this means that our Vibe ladies will be ranking NUMBER ONE going into the Provincial tournament April 20-22 in Waterloo, Ontario. This is very exciting news and the Vibe players are very excited about the opportunity and the challenges that are ahead. On March 24, 2012 the ladies played in the 15U Girls Challenge Cup – Trillium F in Peterborough, Ontario. 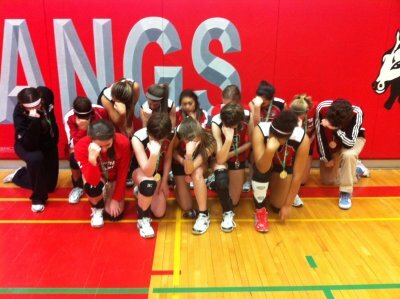 In this U15 tournament the ladies made it all the way to the finals against DRVC 15U. The Vibe ladies were very competitive but in the end lost an evenly matched final and took home a silver medal. This was a very strong finish considering this was a U15 tournament. With the Provincial tournament looming the Vibe ladies will be playing a friendly tournament hosted by the Markham Stingers at Richmond Hill High School on April 7, 2012. This will be a 12 team tournament and provide an excellent opportunity for our team to get in a few more, game situation touches before Waterloo. The Vibe ladies have placed an entry into the Volleyball CANADA video contest. Winning would mean a free entry into the National tournament in May at the Direct Energy Centre in Toronto. After April 9th if we have been selected for the top 5 teams then we are hoping that everyone will go to the Volleyball CANADA Facebook page and vote for us…! Please…! This past weekend the Durham Attack U14 Vibe ladies team made the 8 hour trip (drive) to Wright State University to participate in their invitational tournament. It is a known fact that the Cincinnati area has been a hotbed for volleyball for years, producing top level national players who earn scholarships to some of the most prestigious universities in the United States. Volleyball, like many other team sports, is a game of athleticism, timing, quickness, strength and anticipation, to name a few key elements. When players are motivated, there are three things that combine for a compelling combination; SKILL, PHYSICAL SIZE & GOOD COACHING. In this tournament the nets were higher, the players taller & stronger, and the skill and coaching levels were very high. Now let’s factor in the demographics of a talent pool over 10 times the size of the Canadian market and a national sports culture that pours literally billions of public and private sector dollars into amateur sports development, you now have the recipe for near sports perfect. In the President’s Cup 2012 the Vibe ladies faced competition and pressure unlike anything they faced previously this season. Each match that was won showed them glimpses of their true potential, each match that was lost added fuel to the burning fire of desire to be better. If iron truly sharpens iron then the Vibe ladies have come away from this tournament better and more determined to continue to work hard to improve their game both individually and as a team. The ladies have been exposed to cross-border international competition, and their eyes have been opened to a broad landscape of competition outside the confines of the OVA. They have seen and played against some of the top teams and players in their age group and have looked in the eyes of the same players they may compete with for future athletic scholarships. The Vibe ladies are good; this tournament has made them better in ways they will continue to discover as they look forward to Provincials in April and Nationals in May. The colour of the day was GOLD, that’s right Vibe fans, I said GOLD! I’m not sure what the ladies had for breakfast the morning of this tournament, but may I suggest that they make it a regular pre tournament meal. After winning their pool the Vibe ladies confidently moved their way to the gold medal final to face the PAC MEN (girls team) from Mississauga. The Vibe ladies beat this team two straight in pool play and were ready but not overconfident for the final match of the day for gold. After winning the first game then narrowly losing the second, a third and deciding game for forced to determine the winner. It was close all the way through but the ladies were fierce and were not to be denied their gold willing the tie breaker 15-13. Congratulations on a great tournament, we are all very proud of each and every one of you. Congratulations also to the Vibe coaching staff, with great balance of patience and toughness they are bringing along the team as they improve week by week. We all hope the peak for Provincials and Nationals. Until then the Vibe ladies are looking forward to a 26 team two day tournament in Ohio, USA, more on that when they return. Hey folks! So sorry for the LONG gap between posts but unfortunately sometimes life gets in the way of do the things we really enjoy, like supporting our local sports teams and then blogging about their amazing performances. This entry will cover Team Vibe’s last two tournaments then we will be back with another entry for the U14 tournament from King City Ontario. 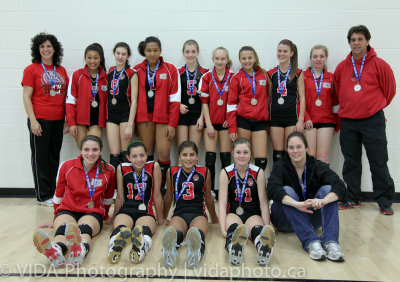 On Saturday November 19th, 2011 the Durham Attack U14 girls vibe team played in the OVA tournament in Coubourg Ontario. Their performance was exciting and they made it to the finals securing a silver medal after a tough loss. 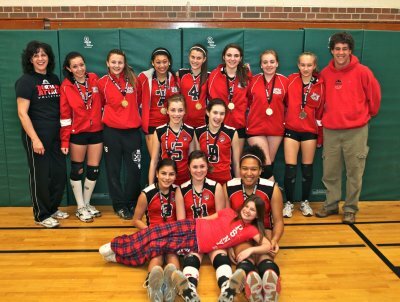 On December 17, 2011 in Barrie, Ontario the Vibe ladies were back to their medal winning ways taking silver to add to their hardware collection. On January 15, 2012 in Stouffville, Ontario in was a Bronze medal to be added. I should also add that this was another U15 tournament and the Vibe ladies played very well. Well done over the past few ladies and keep up the good work, we’ll see you soon in King city. I’d like to begin this commentary by stating a point of fact. When this season began the Girls U14 coaching staff were so impressed with the quantity and quality of the talent pool at this age group, they decided to form two “balanced” teams. This was done with a view to create two equally competitive teams and hopefully a 1 – 2 finish at tournaments including major tournaments like Provincials and Nationals. Well, congratulations to the coaching staff for their success in achieving this goal. On Saturday November 19, 2011 both of the Durham Attack girls U14 teams made their way to the finals of the U14 Provincial Cup tournament in Cobourg Ontario. Team Vibe and Team Heat provided an entertaining and nail biting display of volleyball, splitting the first two sets 25-18 and 20-25. This forced a third and deciding set for the gold medal. Team Heat got out to an early lead in the final set and then Team Vibe came back to sit at game point with the score 11-14. The completive nature and balanced attack of both teams resulted in an 18-16 win for Team Heat. The parents and supporters of Team Vibe would like to congratulate the girls and coaching staff on a well played tournament and a very entertaining final resulting in a well deserved silver medal. We can’t wait for your next appearance on the court. Go Attack! On Saturday November 5, 2011 the Durham Attack girls U14 Vibe team played in their first tournament of the season. This non-OVA tournament was held at Stouffville District Secondary School and was hosted by the Markham Stingers Volleyball club. The Vibe team went through their pool play undefeated and made their way to the final against the Markham Stingers. After losing the first set 23-25, the Vibe girls regained their composure and came back to win the second set 25-20 and took the tie breaker in convincing fashion by a score of 15-8. Congratulations on a great team effort and best of luck in your next tournament in Cobourg on November 19th.